Investigators are also scouring social media, pulling phone logs and running hundreds of license plates, police sources said. 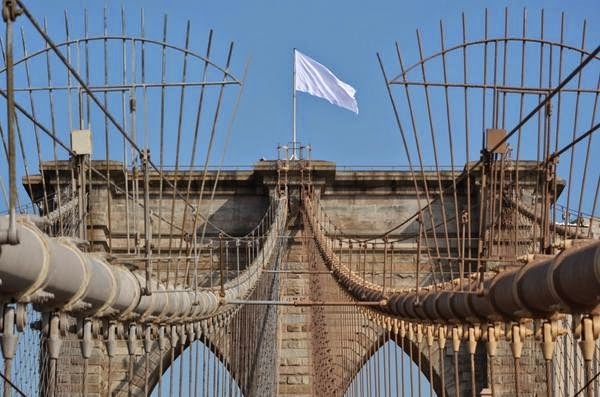 They are tracking down all calls made from the bridge around the time the flags were replaced early Tuesday. They obtained the online handles of at least two of the suspects and are going through computers records for their proper names, the sources said. If law enforcement can go to such great lengths for what "could have been" a terror-related crime, what stopped them from prosecuting investment and bank executives who criminally tanked the economy back in 2007? Instead the government bailed out the banks and the banks had to pay fines, which barely dented their profits. But young people committing what could have been a terror-related crime. They need to be caught and made an example of. We can't tolerate such lawlessness in our society.